Once in a while, when you’re not looking, life up and hands you an absolutely perfect moment. It may be brief. It may not be obvious to others. It may defy explanation altogether. But when one happens, you take down every detail, note every facet, and treasure it forever. For me, one such perfect moment happened during the summer of 2000 when Carole was working as box office manager for the Vermont Symphony Orchestra. In other words, she sold tickets to people who stopped by the office, mailed tickets out to subscribers, and manned a mobile ticket sales table when the VSO went on the road to play concerts around Vermont. 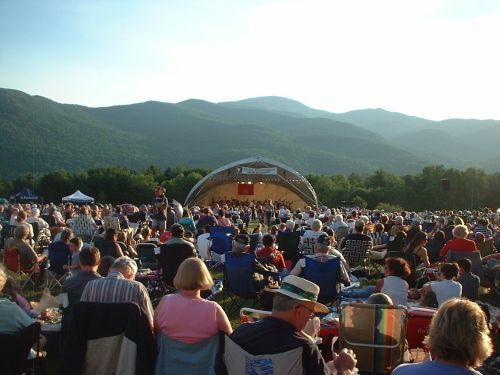 The VSO annually holds outdoor concerts for the Fourth of July in places like Rutland and Manchester and Shelburne and Quechee. I went along to most of the concerts to keep Carole company and to serve as all-purpose gopher, roadie, and coordinator of volunteers. One concert took place at Hildene, the home of Abraham Lincoln’s son Robert, just outside Manchester in southern Vermont. It was a hot sunny day, not a cloud in the sky, just perfect for an outdoor concert with fireworks and the 1812 overture (which together, could reliably be counted on to set off half of the car alarms in the parking lot). The big outdoor tent was set up at one end of a field and Carole’s table was at the opposite end of the field, near where everyone was supposed to park. We had quite a few volunteers show up to help hand out programs, direct people to parking, handle will-call ticket pickup, and so on. Unfortunately, the rest of the VSO staff mostly hung out over at the tent and stage prior to the concert and paid our part of the operation no attention whatsoever… so this meant that no one brought us any water. We all got fairly punchy standing around, thirsty, in the sun, smiling politely at the concertgoers walking in with their bottles of wine and their coolers full of picnic food and drink. Finally, at one point, some of the other staff did wander over. There was a little knot of ’em: the development director, the assistant development director, the publicity and advertising director, the overall office manager, and Carole. Lurking a few feet away was yours truly, quietly eavesdropping but not overtly paying attention. And that’s when it happened. They were discussing logistics and what still needed to be done before the concert started, and one of them — I think it was Mary, the development director, started to say “We need more… we need more…” and then couldn’t think of the word she wanted. I said it in this polite, quiet, helpful, friendly way that left no doubt whatsoever as to what I’d said, only for their brains to utterly crash trying to make what I’d said make sense. It was absolutely perfect: everyone in that little circle of people had the most “what the ___” looks on their faces. Total, unequivocal pole-axed confusion. Everyone, that is, except Carole, who of course was used to me saying strange random gibberish at the oddest of times, and who was kind of peeved at the rest of the staff over having been ignored and not having gotten supplied with water and all that — she was trying hard not to wet her pants laughing. As for me, I was also trying hard to avoid laughing — it was important for the overall effect to work to look absolutely composed and calm, as though I expected my comment to make sense in context. But in my head, I was going “Where the hell did that come from?” Sometimes I even surprise myself. Neither of us had ever seen a group of people all suffer simultaneous blue screens. It was just an absolutely marvelous moment. If I could’ve, I’d have taken a picture right then and I’d hang it on my wall and look at it on cold winter nights.